We are a taco family. We really are! My husband has been on the pursuit for the best Tacos Al Pastor recipe for years. He has perfected them – but more on that in another post! 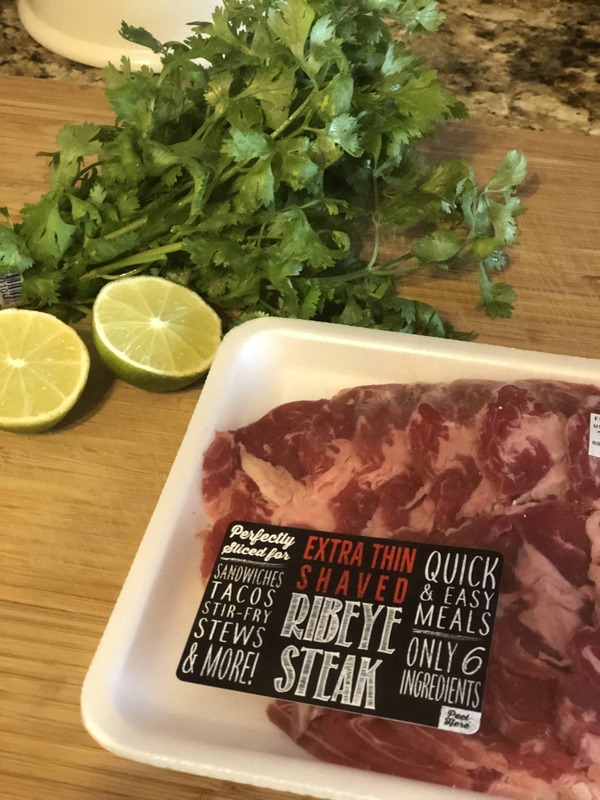 Last night I made Easy Ribeye Steak Tacos. I was inspired when I saw shaved thin ribeye steaks at the market. We had a busy week planned, and there wasn’t going to be a whole lot of food prep time available. With just a few simple ingredients I had dinner on the table quickly, and happy bellies all around! The first thing you want to do is mix together the rub for your meat. This is the seasoning for your steak tacos. Mix together chipotle chili powder, ground cumin, salt, pepper, and garlic powder in a bowl. Set that aside. Next slice up your meat. Make sure to do thin little strips. Now rub the dry ingredients all over your ribeye steak. You will also add the juice of one lime to the meat – just be careful not to do that too far in advance. A half hour is fine. Too long in the lime juice and the steak will get mushy. 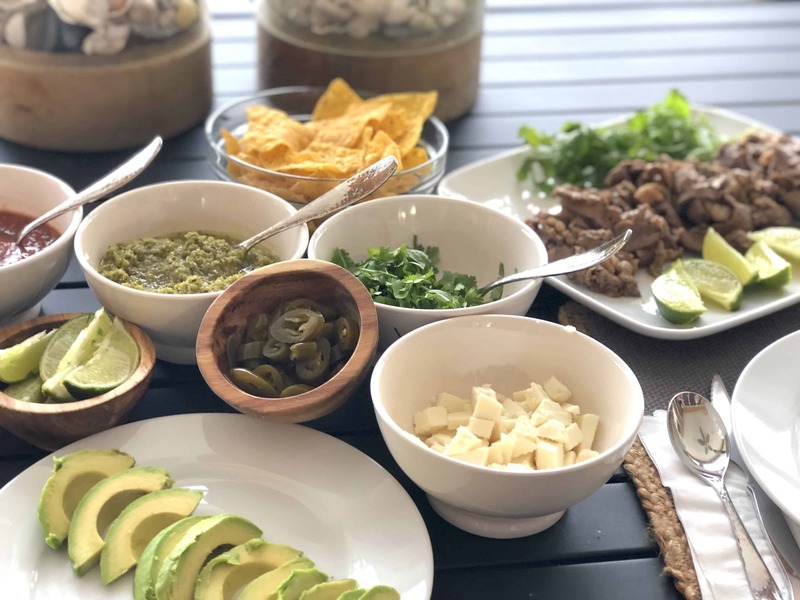 Next, cut your limes into wedges, chop your cilantro, dice your cheese and get all of these ingredients as well as the salsas, jalapeños, and avocados into bowls or onto plates for serving. If you’re entertaining with this recipe be sure to coat the avocados in a little lime before storing – or just wait until right before you serve to cut them. 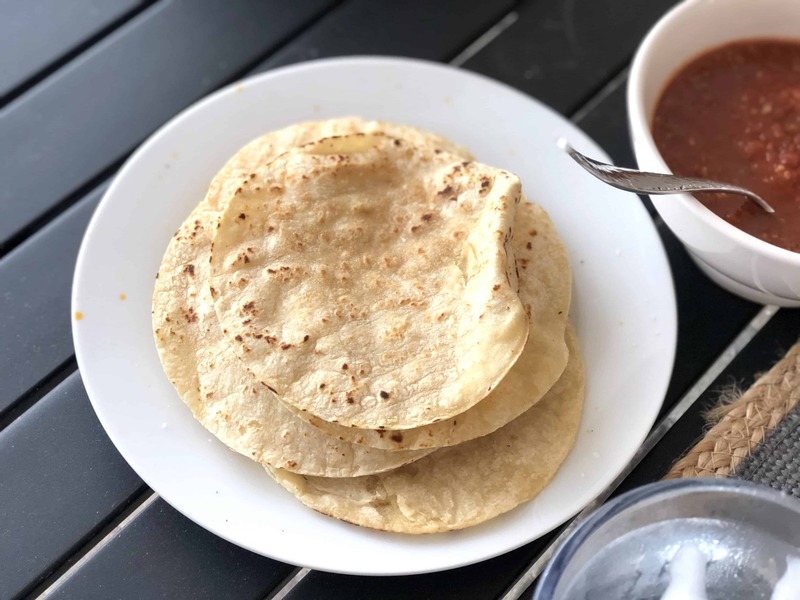 Warming up your corn tortillas is next – and it’s super easy. I use a flat cast iron griddle to heat them up. I spray a little bit of cooking spray onto the surface after it’s hot and warm each tortilla on the griddle for about a minute and a half on each side. Then I simply pile them up and put them on the table with the other ingredients. Your steak is your last step. Heat a cast iron frying pan to a medium high heat. 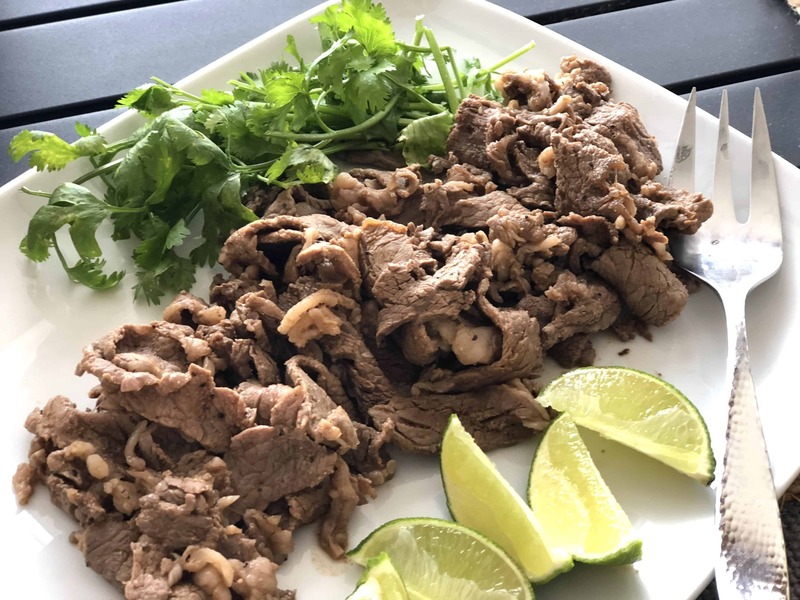 The steak for the ribeye steak tacos is so thin that it only take a minute or so to heat up. Don’t overdo it. As soon as it is cooked to your liking, remove it from the fry pan, and you’re ready to go! Our family doesn’t like raw onions (except in salsa), but certainly they are a common topping for tacos, and I encourage you to use them. I imagine they’d add a nice zing. We added some chorizo to my husbands tacos, and he even added a little Mexican crema to his as well. I kept mine pretty simple. I had this dinner on the table in under 30 minutes. 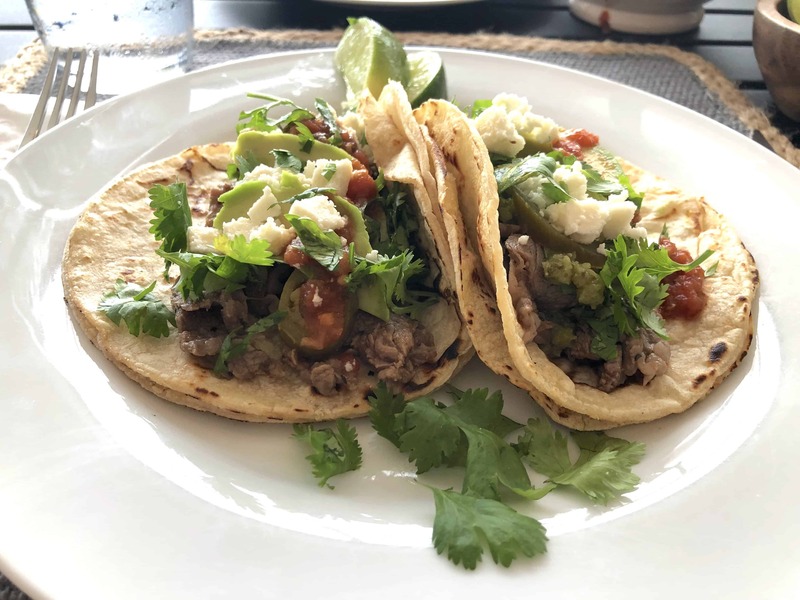 Ribeye Steak Tacos are an easy meal that you can use to have on the table in 30 minutes - or even use for entertaining! Step 3 Squeeze the juice of 1 lime over the steak (for no longer than a half hour). Step 4 Prep remaining ingredients (slice limes, chop cilantro, dice cheese, slice avocados and pour salsas into bowls for serving). 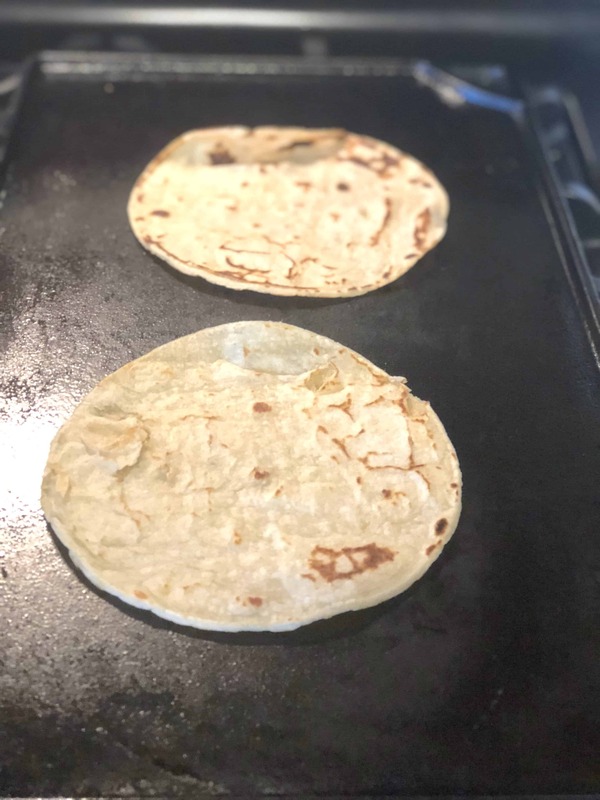 Step 5 Warm corn tortillas on cast iron skillet sprayed with cooking spray for 1.5 minutes per side and pile for serving. Step 6 Cook steak in cast iron fry pan for about 2 minutes total or until desired doneness. Step 7 To Make Your Taco – add all of the ingredients into the tortilla and enjoy! Step 8 Adjustments: diced onions, chorizo, pineapple toppings.